Hatters boss Nathan Jones wants to finally get one over on Cheltenham this weekend when the Robins head to Kenilworth Road. The Town chief has come up against Gary Johnson’s side three times since taking the helm at Luton in January 2016, with two draws at Whaddon Road, while they were beaten 3-2 on home soil last season. However, Jones is determined to come out on the winning side at the fourth time of asking, as he said: "We haven’t beaten them since I took over, they’re probably one of the only sides we haven’t beaten and it will be a tough game. 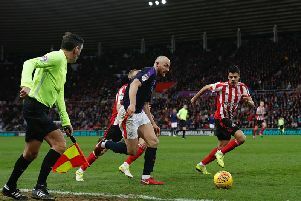 “They came here last year, we actually played fantastically well and then probably for 60 seconds of the 95 minutes, we switched off, from a corner, the keeper (Stuart Moore), a big error on his debut, that was understandable, then two counter attacks and we conceded. Town had looked destined to change that unwanted stat in the game at Cheltenham this season, leading 2-1 going into stoppage time, only for Will Boyle to prod home from close range with keeper Scott Flinders up for a corner. Jones continued: “It was one of those games, similar to the Stevenage game (1-1). “We played better down there than we did at Stevenage, granted, but when you take the lead late, you expect to see it out. “They were the two disappointing results. I can accept and stomach others, but those are the two that when we’ve dropped points, I’ve been most disappointed with. “We drew at Morecambe away and should have won the game we felt, but it was a good game. Meanwhile, when asked if he felt he had got into the head of his former charge, with Jones playing for Johnson during his time as Yeovil manager, the Cheltenham boss told the club’s official website: “No, Nath has put a good team together there and he has to concentrate on the things he has done with his team. “They are the best team in the league by a million miles in my opinion and I think they will do well at the next level as well. “I don’t need to get into his head really. Sometimes managers can be a bit paranoid with what other managers have said, but he was a good player for me and a good coach. “I could drop something in, but if they win 5-0 he has to just talk about how well they’ve done.